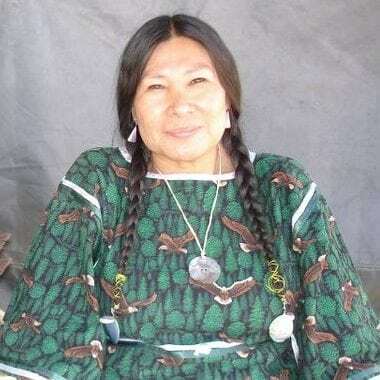 My first and only spiritual Lakota name is Mato Wiyan, (Bearwoman). I am full blood, 4/4, BIA # U-28841, from the Pine Ridge Indian Reservation. I am the daughter of Noah Helper and Mary Afraid of Hawk-Mexican, known as Mary Johnson. On my mother’s side I am the granddaughter of the late Charlie Mexican and Dorothy Afraid of Hawk (she is still living). On my father’s side, I am the granddaughter of Jake Helper, son of Samuel Helper, who survived the infamous Wounded Knee Massacre (Samuel was nine years of age during that dark, sad day the Longknives took his entire family) and Evelyn Poor Thunder Helper (still living). Evelyn Poor Thunder Helper is daughter of John Poor Thunder and Carrie Comes Again. I begin with the permission of my Grandmothers and Mother who seeked council advice from the oldest of our male family members. I am the wife of David Swallow, Jr. (Wowitan Yuha Mani). I consider myself no higher nor better than anyone. I believe that we are all the same, that we each all carry a gift from above and below, what’s on earth is in the heavens. I do as I was assigned with spiritual guidance to help whether it’s at home or at the ceremonies. I used to be quiet. I learned to be humble and do my very best to be obedient and honest to whatever I am doing. As a woman we want our voices heard also in a good way. The people have been through too much suffering as it is. We are all survivors, one way or another. There are certain boundaries that we don’t cross when it comes to Medicine People. As I was growing up, I witnessed a lot of abuse and misuse, also neglect, from our people as well as others. I’ve seen people come to the Medicine Men and Women with wrong intentions. Our own Lakota people are neglecting the Medicine Men so some of them go out off the reservations. Some of them don’t get monthly income from the government or tribe, even food stamps or commodities, but still they continue to help people. I see them that they carry all the ugliness from the negative, so the people could survive. The real enemy is the alcohol and drugs, that is the real war, not among each other in this Sacred Hoop. If a wrong is committed, what they say is abusive, then pray, so that these things do not happen again. I learned that the Wowakan [the Sacred] takes care of itself, before, during, and after the ceremonies. These accusers should come forward to the ones they are accusing. Not to blame all the Medicine People or the ones that have Altars. There should be a council set for these things to take care of it, the Lakota way. Go to the wise Elders and Medicine People who know how to handle these matters before taking it to another level or even to the White Man’s Court. There are certain issues that belong to the man, and woman should take care of women issues. Its embarrassing that men should step in or even speak about womenly issues. I felt I had to mention this, since this is a Lakota problem. Women should not be excluded from spiritual problems. Women are important in all tribes. When we gave birth to our generations, we shed blood, pain, and tears, sometime even death. What I’m trying to say is that Mato Wiyan don’t like how our nations problems are broadcast all over the world. I feel that the government system is laughing at us, like we can’t handle ourselves. We give him the opportunity to add another notch of his belt to say we are incompetant. We are now living in, and past, some of these prophecy’s that the wise Elders and Medicine Men and Women talked about. We should be preparing our children for these things as well. Start saving water, make the dried meat, make the dried corn and berries. Save blankets. Something is coming. I feel that Great Spirit has given us time to prepare ourselves. When I am in ceremonies, I hear the women cry. I cry because I know, as women, we’re absorbing all of this pain, suffering of the people. We absorb the negatives that are happening with Mother Earth. We feel the war, we know that blood is spilled on the ground someplace, somewhere. When all of this confusion is happening, did not one person bother to ask the mothers of the C’anunpa Carriers, the Sundancers, even the ones that go on the hill? We should have been asked what we wanted. My husband and I, our family, has been under fire from rumors and gossip for seven long years. I have seen our children get cornered, I’ve seen how they do their best to defend the family and themselves from our own people who savagely attacked us year after year. But still we continue like the buffalo against the storm. We have taken courage beyond anything to continue our lives. We walked beyond the limits of forgiveness. Great Spirit made everything that is on this earth, that even includes all mankind, these are all his sacred children. Whether they commit good or wrong in Great Spirit’s eyes, there is no color. We have a lot of healing work to do. Those of us who are spiritual people like the C’anunpa Carriers, the ones that Sundance, that go up on the hill. Stop arguing about these sacred matters and let’s get to work.